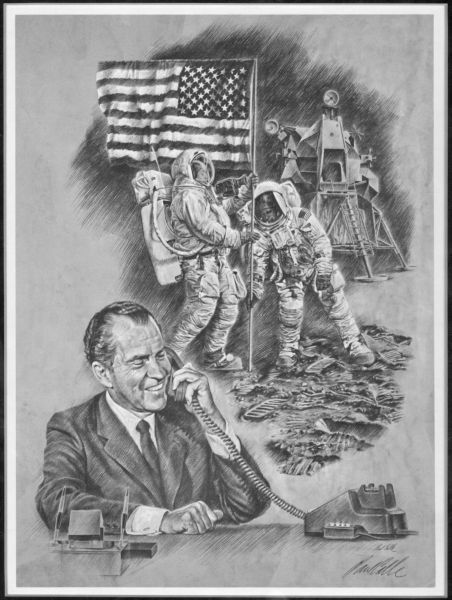 Among the numerous fascinating oddities stored in the Wheaton College Archives & Special Collections is this reproduction of an original drawing first presented to President Richard Nixon in Washington, D.C., in October of 1969, depicting the historic first telephone call to the Moon. The framed reproduction was presented to Dr. Hudson Armerding, President of Wheaton College, on January 16, 1970, by representatives of the Telephone Engineer & Management magazine. It is personally signed by artist Paul Calle.